At two o’clock in the morning on Monday, April 5th, I received a text message telling me the news. There had been a horrible electrical fire at 137 Thompson St, where Thompson Chemists is located. The damage was extensive and everything was lost. Thankfully, the fire was contained and did not spread to any of the building’s residents, nor was anyone hurt due to the sixty phenomenal firefighters who responded to the call. It was hard to do but we kept our heads high! When I arrived five hours later, the scene completely devastated me. The ceiling was stripped away, broken glass and debris were strewn about and harsh black burns encircled the store. Everyone stood outside looking at the damage in silent, tearful horror. We shared our grief and dried each others tears in this moment of sadness. Then with Gary and Jolie’s incredible know-how and each other’s reassurances, we put our game faces on and went straight to work. Over the next week and half, each individual–Imani, Nina, David, Bryan, Ashlee, Jazmin, Emily, Angie, Chad, Irit, Allison, Vasily, Christy, Cindy and Gus– has pulled their weight and come together to work with the Alonys’ in rebuilding the amazing little pharmacy that they founded 16 years ago. It has been hard work, but we are all hard workers. 137 Thompson is evacuated and has temporarily moved a block away to 449 West Broadway. Fortunately, we had managed to save all our patient information and so we are fully functional and are able to dispense prescriptions. 137 Thompson will be rebuilt and hopefully reopened in a few months time and 449 West Broadway will hopefully become Thompson Alchemists; an exciting project the Alonys’ have been working on for quite some time. 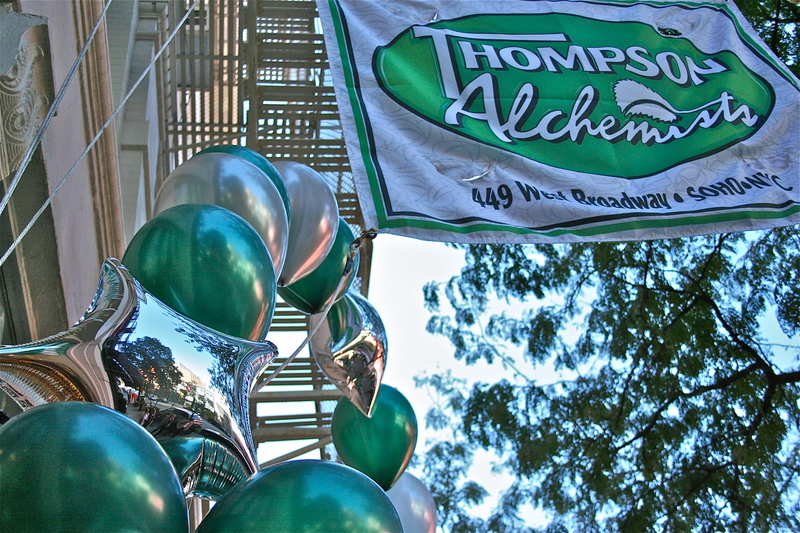 This Sunday will mark the two-week anniversary since Thompson Chemists burnt down. The store and its’ employees have since rebounded in ways that I never thought possible. It is mind-blowing the progress that we have made in the past week and half, and I have been completely moved in seeing the extent of support and kindness given to us from the community and each other. We extend our deepest, warmest, most heartfelt thanks to all the awesome neighborhood boys and girls that helped us move into the new store at 449 West Broadway, to all of our wonderful friends that have graciously donated supplies, and most importantly, to all of our loyal customers and their kind words. We have the absolute best people with us and for that we are so beyond grateful. We love you!